Having any injury to the face is a traumatic experience. Most patients want to be certain they are receiving the highest level of care possible. Typically patients seen in the emergency department are simple referred to who ever is “on-call” for the hospital that shift for further consultation. Every doctor on call is not an expert in facial trauma. These physicians may not be the best qualified to evaluate and manage your condition. Before having surgery you should always consider getting a second opinion. To learn about all your treatment options from a certified specialist please contact us today. The first step is to call or e-mail our patient care consultant, and request a preliminary Phone or In-Office Consultation with one of our specialists. Please provide clear, recent close-up full face photos portrait, profile, oblique, and nasal base full Photos should clearly show your area of concern and can be sent by mail or e-mailed. This can also include CT Scan images and/or x-rays. Our specialist will review your history, physical exam findings, all reports, films and photographs before your consultation. It is very important that we have all your information prior to your consultation. This is especially important in revision cases. If you are having difficulty obtaining your records from your prior surgeon or institution contact us and we can facilitate and/or expedite the process for you. We will need you to sign a release of medical records to our office prior to us contacting your physician. After reviewing all your information our specialist will then discuss all your surgical options and together you will come up with a customized treatment plan. Finally, our Patient Care Consultant who will discuss pre-operative care, costs, recovery, local accommodations and any questions related to your procedure(s), will then contact you. Shortly after your surgery is scheduled, you will receive a packet in the mail containing pre-operative instructions and procedure consents. These documents must be read carefully and all instructions followed closely. All contents must be signed and initialled. The entire pre-operative packet must be brought with you to your pre-operative office visit. If you have any questions at this time, please do not hesitate to call or email the office for clarification. 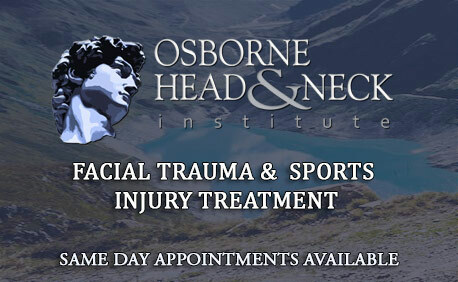 At the Osborne Head & Neck Institute, all of our board certified physicians perform all surgeries from start to finish. Although we conducted clinical research studies and contribute a significant amount to journals and publications we are not a surgical-training center. This simply means that, each doctor is a board certified facial plastic surgeon, and performs ever aspect of your surgery beginning to end. We do not allow residents, fellows, or other trainees to perform any portion of your surgery. We advise all patients that fly-in for surgery to spend at least the first night after their procedure in a local hotel or after-care facility, thus ensuring convenience for any required medical attention. In the days that follow we will see you post-operatively and, depending upon the procedures that have been performed, you may return home within 5-7 days after arrival in Los Angeles. In the event that you require any medical attention after returning home, we will refer you to a local physician for a check-up. Your health and safety remain our number one priority. We look forward to meeting you and assisting in your care.